31 Corn Lane’s totally handmade purses! I just got this handmade purse by Indie Designers, 31 Corn Lane. It’s a small company started by 3 sisters and they make these adorable purses, totes and wallets. Inside, they are lined with bright eclectic material. I love this purse! Check below for an interview they did on Threadbanger.com. Eat Your Heart Out, Valentine’s Day. I wrote a blog post on Threadbanger.com of some of the edible heart shaped foods I found on the web and links to how you can make them…. in lieu of Valentines Day…Check out the post here! Threadbanger at SF Renegade Craft Fair 2008! So as you may (or may not) know, my day job is working for Next New Networks and one of the shows I work on is Threadbanger.com. A few weeks ago, I got the honor to travel to San Francisco and help them out at the Renegade Craft Fair. As you know, I made my first hobo bag below. Anyway, here’s a wrap up of what happened at the show! Plus a look at some seriously awesome DIY indie designers! How to make your own cleaning products! Spring is here and that means its time for Spring Cleaning! For those of you don’t want to use those chemical cleaners that you see at regular drug stores, check out this episode and see how you can MAKE your own cleaning products out of natural ingredients! How to make a Baby Pod! What’s a baby pod, you ask? Well it’s this little sweater / jumpsuit thing that your baby wears! It’s super simple to make and it’s really cute. Plus, you’re baby will look just adorable in this. Thanks Threadbanger for showing us how to make this! Also, if you are concerned with the drawstring around the hood (kids under 5 aren’t supposed to have drawstrings; they’re very dangerous) then just substitute it for elastic! I always have huge baggy sweaters and have nothing to do with them. 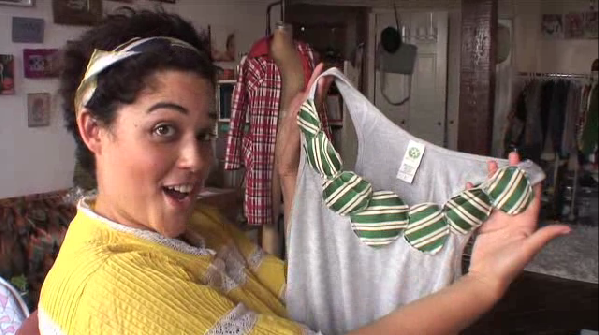 Thankfully, Rob and Corinne featured Compai on their show and they showed us what to do with our old sweater.